SLAYER, the most badass thrash/metal band on the planet, will see Issue #1 of its three-comic book series Repentless released on January 25 through Dark Horse Comics. Get a sneak peak at six preview pages from issue #1 HERE. The comic book series is based on SLAYER's brutal Repentless music videos, written and directed by B.J. McDonnell (Hatchet III) and scripted by director/producer Jon Schnepp (Metalocalypse, The Venture Bros., The Death of Superman Lives). 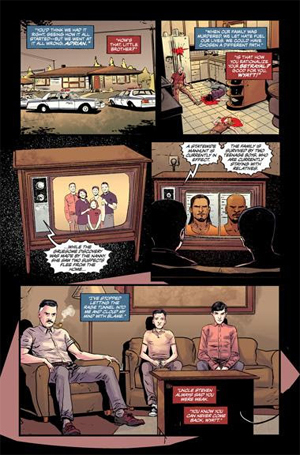 Twilight Zone artist Guiu Vilanova created the inside artwork, while Eisner Award-winning British comics artist Glenn Fabry drew Issue #1's cover, and Eric Powell (The Goon, Hillbilly) created the variant cover. Said SLAYER's Tom Araya about Repentless, "We're telling the story that we've always told about society and how humans treat each other." In September 2015, SLAYER released Repentless, the band's 12th studio album, the first without Hanneman and first with producer Terry Date, to widespread rave reviews and the highest chart debut of the band's career. The band also teamed up with director BJ McDonnell for three high-concept and brutal music videos for the album tracks "Repentless", then for "You Against You", and the most recent, "Pride In Prejudice".